As an academic living through the rapid and sometimes brutal commoditisation of universities, there are days when I secretly feel a sense of foreboding, as though I’m some sort of well-meaning druid about to be slaughtered by the Romans. Beware, therefore, if you are of a nervous disposition and about to launch into reading this book. It may make you want to pull the duvet over your head and never get up again, once the stark future of academic publishing is laid out in front of you on your Kindle (if you can manage to download it, of course, which I struggled with). Martin Weller’s book is written in a beguilingly approachable style, reminiscent of 101 position papers and blog posts aimed at thrashing out the role of the modern university within contemporary society. However, there the similarities end. What we have here is a clear and unequivocal account of how higher education is being dismantled in order to monetise that most precious of assets, namely the contents of academics’ heads. 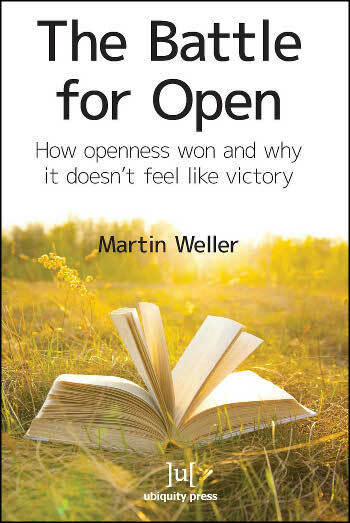 The Battle for Open is free to download, although you can order a hard copy if you prefer. It starts with a potted history of “openness” and its links with the early development of the internet. Luckily, it does not claim to be a comprehensive account, but rather lays out the territory for the arguments to follow. It therefore provides enough information to be useful without inflicting tedium on the reader. We move through a detailed explanation of the gold standard in open publishing (basically craftily getting authors and their universities/funders to pay for something that they have already donated to the publisher for free without gaining a share of the profits, unless I have misunderstood the business model here). The tone then becomes progressively darker. We read of Silicon Valley and its toxic “education is broken” mantra, whereby entrepreneurs spin a story of educational dysfunction in order to excite venture capitalists to new heights of apparently futile investment. We read of Moocs, or massive open online courses, and how they exclude many students who are not used to studying independently using the materials of elite institutions. We hear of academics obliged to venture into developing online identities, blogs and Twitter accounts, with no security of tenure should that free speech thing backfire. The difficulties of archiving, rights and reuse of material are made very plain. Finally, Weller spells out in no uncertain terms the utter wastefulness of the current research council model of funding, which involves a lot of individuals giving up months of precious time, handcrafting perfectly good research proposals that are likely to end up in a digital wastepaper basket for no other reason than, well, society can’t be bothered to fund them. We should see Weller’s book as a call to arms. Instead of struggling on with our inadequate technological infrastructure, plodding commercial software packages, frustrating quality assurance forms and pointless research frameworks, academics need to be a lot braver and rediscover what it means to engage fully with pedagogy and research in higher education. What’s more, we need to be more uncompromising, and start to develop our own 21st-century tools and ways of working. Now that would be worth getting out of bed for. A great look of the Open Education movement as it transitions from an outsider movement, to an incumbent. Topics covered include Open Educational Resources, Open Access publishing, Open Data, Massively Open Online Courses (MOOC's) and Open Pedagogical Practices. One of main questions Dr. Weller raises is who or what will shape the next phase of the open movement: educational institutions, or corporations? A great read for all educators.